An indigenous woman from La Guajira in the north of Colombia has travelled directly from the continuing blockade of a controversial coal mine, directly to London to attend the AGM of BHP Billiton, the company that co-owns the Cerrejón mine. On October 15, more than 2,000 indigenous people from Colombia blockaded roads leading to the Cerrejón mine site, reportedly shutting down 40% of the mine’s operations. Protesters are now blocking the railway which takes coal to the export port. The mine has been the subject of international criticism over the forcible displacement of communities when mining began, and decades of air and water pollution which have had disastrous impacts on the health and traditional ways of life of neighbouring communities. Recently the company came under fire for a plan, now on hold, to divert the only major river in the semi-desert province. Yasmin Romero Epiayu, an Indigenous Wayuu woman from the Epiayu clan, has travelled from the blockade in Colombia to London to take part in the BHP Billition AGM on Thursday 24 October, to tell shareholders why the Wayuu people have been driven to take such drastic measures against the Cerrejón mine. On Thursday Yasmin Romero Epiayu will enter the BHP Billiton AGM to address the board of directors and describing the impact that the coal mine has had on her community. The AGM will also be attended by a representative of Indonesian communities opposed to BHP Billition’s coal mining in ecologically sensitive parts of Borneo. 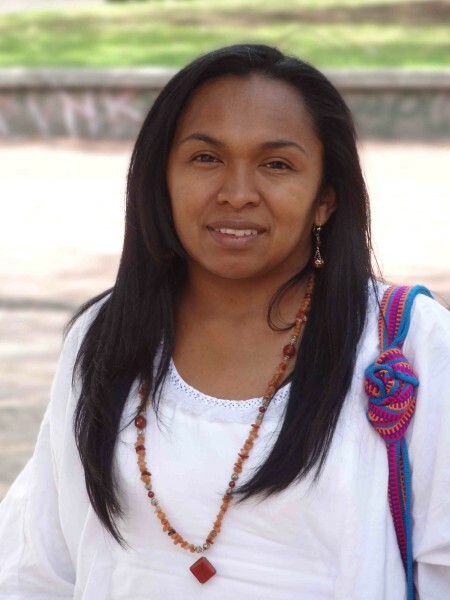 Yasmin Romero Epiayu is also taking part in the World Development Movement’s “Carbon Capital” speaker tour around the UK from the 20 to 31 October, organised in collaboration with London Mining Network, Colombia Solidarity Campaign and Down to Earth. Cerrejón is a giant open-pit coal mine in La Guajira, northern Colombia. The mine is jointly owned by three of the world’s largest mining companies; London-listed Anglo American, BHP Billiton and Xstrata. Tatiana told us about how the Colombian government has presented Cerrejón as an example of responsible mining. However this is far from the truth. The Cerrejón mine is located in Wayúu indigenous territory and when mining began 30 years ago local people were not consulted. Instead their lands were seized and communities were forcibly displaced, violating their constitutional land rights. The Colombian government has failed to adequately compensate any of the affected communities. Pollution and dust from the coal mine has caused the contamination of water supplies and the air. Indigenous groups report that their traditional lifestyle has been badly affected, soil pollution has caused failed crops, fishing areas have been contaminated and displacement has disturbed inter-community relations. The creation of the mine has failed to significantly boost the local economy – La Guajira is still one of Colombia’s poorest regions. Paramilitaries from the mining company continue to threaten and pressurise local communities.